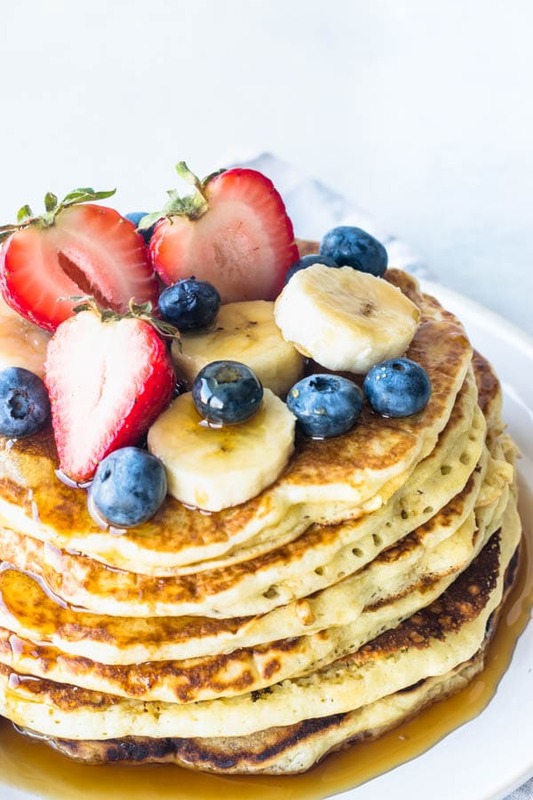 These are not only Banana Pancakes. 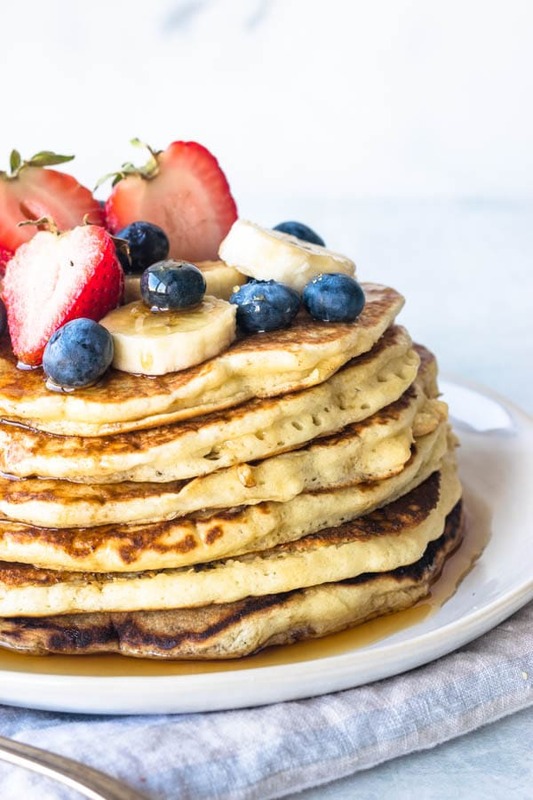 These are Banana Sourdough Pancakes. It means I used a little bit of my starter to make pancakes! Have you ever baked sourdough? Years ago, I started my first sourdough starter. That was actually 2014. I was just getting into baking bread. I got the book The Bread Baker’s Apprentice , by Peter Reinhart. And I swear I baked almost every bread in that book. And this book had a whole section on sourdough bread, including how to grow your own seed culture and turn that into a mother starter. I kept my first starter alive and well for over a year! After the death of my first starter, I could never keep another starter for longer than a few weeks, just enough for one or two loaves. I would forget about them, simply neglect them, and end up throwing them out. But I never quit trying to build and keep a starter, I just wouldn’t follow through. Until one day, I bought this book. It’s called Artisan Sourdough Made Simple , by Emilie Raffa, blogger behind The Clever Carrot. This lady, my friends, that’s a true bread lover right there. I know one when I see them. And the way she teaches you how to make sourdough is truly inspiring. 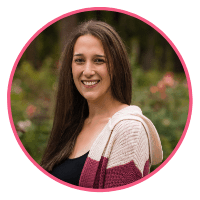 She makes you connect with the process of cultivating the yeast, caring for it, and using it to create beautiful recipes. Emilie’s approach to sourdough baking is liberating. For the period of time that I had my first starter, back in 2014, I can tell you, I was having a lot of fun. I learned a lot from Peter’s book. However, I never felt truly confident in my sourdough baking skills. I never made a loaf that made me stand so proud like my cake creations. That was quite hurtful for a passionate bread baker such as myself. I am the granddaughter of bakers. My grandparents had bakeries back home, in Brazil. My grandma woke up before the sunrise everyday to bake bread at her bakery for almost 50 years. From Sunday to Sunday. She rested on Christmas Day. That’s the kind of commitment to baking that I aspire to have. And whenever I baked a loaf of sourdough, I wouldn’t feel that committed to it. That’s because I was getting hung up on the technical stuff, the measurements, the feeding after 24 hours, on the dot, kind of thing. I pulled up my sleeves last week and decide to star the journey all over again. Day one was a Sunday, I started my brand new starter. The following Sunday, I was baking sourdough. It was the best sourdough I had ever baked. I had finally achieved the perfect crust, the beautiful air pockets, the tangy taste! I decided to keep my starter out of the fridge, so that means I’d have to care for it pretty much every single day, feed it, tend to it. It’s not much, it takes 5 minutes of my day. And because I have to feed my starter everyday, I end up with a lot of starter leftovers that are meant to be discarded. Instead of discarding my leftovers, I’ve been trying to come up with recipes to use those precious little pieces of life! Also, it’s common for some of the geeky bakers to name their starters. I’m a geeky baker. Therefore, I name my starters. So I called this one Phoebe. Phoebe is currently living on top of my fridge, which is a nice warm spot, where I keep her fed, happy, and alive! Her house is a little jar, Phoebe’s Shack, and she just chills all day, ready for me when the ideas and baking impulses happen. I kinda have a lot of those. Baking is almost like a compulsion to me. I do it out of instinct. My heart and my soul are guiding me. Jeez, how cheesy. I’m a cheesy geeky baker. And I have no shame in it. Baking sourdough just fulfills so much of that urgency to bake. It’s an art, really! It’s creating life, out of thin air, quite literally. And it’s turning life into amazing creations. And that’s exactly why I am talking about my love for baking sourdough bread right here on a post about pancakes (which isn’t even baking at all, either). Because, ultimately, when it comes to sourdough, baking, cooking, creating, there are really no limits or boundaries! The true secret to baking sourdough, cooking a stunning meal, making a drop-dead gorgeous cake, is simply using your intuition. Connecting with the food. Connecting with what it means. That’s why baking sourdough is such a good exercise towards developing your intuition as a cook and as a baker. Because baking sourdough successfully, entails dedication, commitment, and a great deal of intuitiveness. 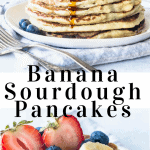 These Sourdough Banana Pancakes are the fluffiest most delicious pancakes of all times! 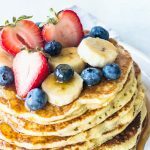 This is my go-to pancake recipe! Mix sourdough starter, milk, melted butter, and eggs with a fork. Add flour mixture to wet ingredients. Whisk until batter is smooth. Add mashed banana and whisk. Heat a non-stick skillet over medium-high heat. Spray it with cooking spray. Ladle some batter in the skillet. Cook for about 2-4 minutes and flip. Cook for another 2-4 minutes on the other side. Remove from heat and proceed with other pancakes. Keep your eye on the heat so it’s not too high and burning the outsides of the pancakes while leaving the inside undercooked. Serve topped with fruit and maple syrup if you wish. Haha I love that you name your starters. I think your pancakes look so perfect and beautiful! I have so many bread cookbooks but I don’t have Artisan Sourdough Made Simple. I am going to Amazon to check it out. I love the name of your blog :). Thank you so much, April!! I appreciate your thoughtful comments!! I am so happy you are encouraged to give sourdough a try!! I love sourdough bread! I’ve been thinking of trying to start my own starter soon and this makes me want to even more! Those pancakes look amazing! And oh my goodness Camila- that pour shot! Lisa, you should definitely do your own starter, if you’re into baking bread!! It’s really rewarding!! 🙂 Thanks girl! 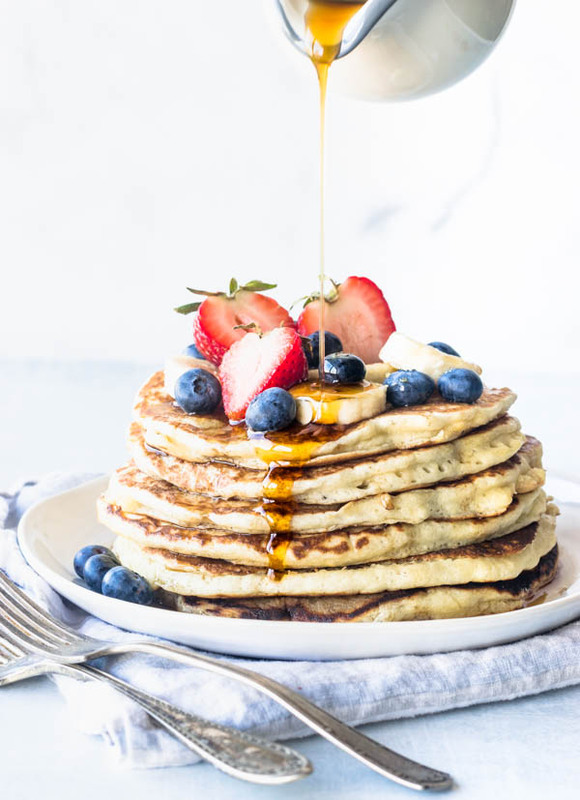 These pancakes look so dreamy! I cannot make pancakes. Each time I try it’s always a total disaster. I have tons of cookbook in my pantry, but surprisingly none for bread only. I”ll have to check out Artisan Sourdough Made Simple. I think you just sold me on buying this book LOL. I can just eat the pancakes right off the screen. You know I’m pinning this one!!!!!!!!! love it! These look absolutely delicious – and your photos – WOW! Where did you learn to take such gorgeous photos?? Pour shots are so difficult for me and you nailed this one! haha I know, that’s a struggle I have all the time, so always creating recipes and adding to my pizza dough, crackers, other breads lol. And I am so happy you like the recipe!! That’s so cool that you have a rye starter! So do you feed it with 100% rye flour? very interesting!!! Thank you Jacqueline!! Have a great day! !